Situated in an office park north of Dallas, a team of 23 people conceive, design and assemble the products that drive AV installations at the headquarters for NASA, corporate giants The Home Depot, and sports arenas such as the Louisiana Superdome. Contemporary Research, established in 1994 by industry lifer Scott Hetzler, has built a reputation for quality and agility that its founder attributes to housing the entire design, manufacturing and servicing under one roof. When Hetzler founded Contemporary Research, instead of offshoring his designs, he called upon a local network of engineers, colleagues and friends to help build this niche AV manufacturing company. His vision has paid off handsomely, leading to the industry’s first multipoint AV router designed for control system integration. The company was also an early leader in large-scale TV integration and control, and was ahead of the digital TV transition in the U.S. with the first HDTV tuner. By manufacturing in the U.S., Contemporary Research is able to achieve fast turnaround from concept to finished product, while maintaining a firm grasp on quality control. The company makes small quantities of its products at a time, lending a boutique-style attention to detail within the company’s sophisticated manufacturing facility. Housed together, the design and deployment teams are in constant contact on hardware and software updates, ensuring that integrators get the latest product versions for their clients. This close relationship also allows the team to quickly make changes of virtually any scale to its products, in real time—a valuable asset to integrators and customers alike. Completing the circle, the in-house customer service team—comprised of former AV integrators—is able to understand and react quickly to system integration issues unlike any other team in the industry. By keeping its experienced eyes close to the ground, Contemporary Research’s service team has the unique ability to respond to market needs directly to integrators. 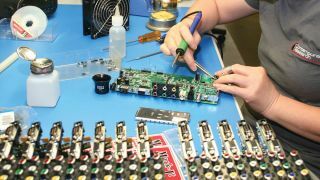 Take a look inside Contemporary Research’s U.S.-based facility and see why ‘made in America’ can make all the difference with your customers.